The twice-divorced President of the US wished the Amazon CEO luck. Bezos and his wife announced they would divorce on Wednesday. Later in the day, the National Enquirer - whose chairman and chief executive, David Pecker, has been a close Trump ally - reported that Bezos has been having a relationship with Lauren Sanchez, a former TV anchor and helicopter pilot and the wife of Hollywood talent agent Patrick Whitesell. The Enquirer said it had been actively investigating the relationship between Bezos and Sanchez for four months. The New York Post also reported the relationship and said Whitesell and Sanchez are separated. 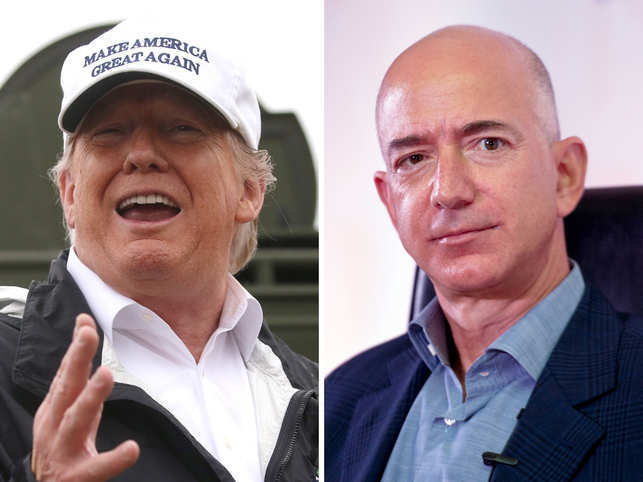 Trump has a history of publicly attacking Bezos and his company. The president has criticized coverage of his administration by the Bezos-owned Washington Post, and he’s pressured the U.S. Postal Service to raise the prices it charges Amazon to ship its packages. Pecker is cooperating with federal prosecutors who are investigating so-called catch-and-kill payments the Enquirer made ahead of the 2016 presidential election to at least one woman who alleged she had an affair with Trump. The Enquirer secured the rights to the material, assuring the allegations wouldn’t be shared with other media, then never published the story. When: 1999 Settlement: $1.7 billion Media mogul Rupert Murdoch and journalist Maria Torv were married for 31 years and have three children together. But the couple had diverging plans for when Murdoch would retire, and they agreed to an “amicable separation” in 1998. Details of the separation are sparse, but Torv is rumoured to have received $1.7 billion. Both parties seemed to have moved on quickly: Murdoch married Wendi Deng 17 days after the divorce, while Torv married William Mann six months after. When: 2009 Settlement: $1.2 billion Formula One executive Bernie Ecclestone, one of the richest people in the United Kingdom, divorced Croatian model Slavica Radic in 2009. The settlement was estimated at $1.2 billion, and although the details aren’t completely clear, there appears to be an unusual twist — Radic seems to be the one paying Ecclestone. When: 1999 Settlement: $3.8 billion The costliest known divorce occurred in 1999, when French-American businessman and art dealer Alec Wildenstein divorced his wife of 21 years, Jocelyn Wildenstein. The high-profile divorce proceedings resulted in Jocelyn being awarded $2.5 billion and $100 million for each of the next 13 years, for a total of $3.8 billion. When: 2010 Settlement: $1 billion Las Vegas casino bigwigs Steve and Elaine Wynn were married to each other not once but twice, from 1963 to 1986 and from 1991 to 2010. Their second divorce is said to be one of the most expensive of all time. The settlement is estimated at $1 billion.